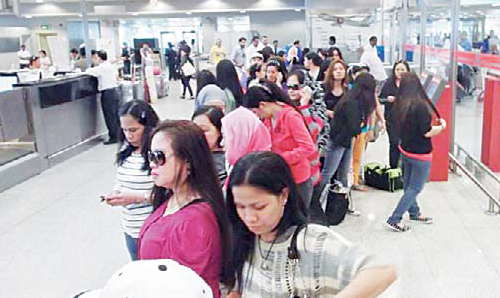 KUWAIT CITY, Oct 6: A total of 57 undocumented Overseas Filipino Workers (OFWS) or whose residence visas (iqama) have expired were repatriated to the Philippines on Saturday evening as part of the series of mass repatriation of stranded OFWs in Kuwait. Philippine Embassy officials led by Consul General Atty Raul H Dado together with attaches Musa Ibrahim, Joseph De Claro, Anthony Villanueva and Cathy Guison were at the Kuwait International Airport to see them off and to assist them during their check-in at the airport. Most of the undocumented OFWs worked as Household Service Workers (HSWs) who were victims of nonpayment of salaries, fatigue, lack of food, physical, verbal and sexual abuse prompting them to escape from their employers. These repatriates did not seek the refuge of the Filipino Workers Resource Centre (FWRC) but opted to stay outside to find alternative jobs. Some found jobs with meager salaries while others stayed with their friends. The distressed OFWs beamed with happiness and excitement as they checked in at the airport. “I’m very happy that I will be with my family again and we would like to thank the Kuwaiti government and the Philippine embassy for helping us go home straight to the airport,” stated Marivic who escaped from her employer due to physical abuse. Consul General Dado disclosed to the Arab Times that the repatriates who have no legal cases, shouldered their own air tickets as they flew out of Kuwait without being detained. “This is a part of our continuous repatriation program. It was expedited because the procedures were made easier for us. With the help and cooperation of the Ministry of Interior, all their necessary travel documents were processed and they went straight from the embassy to the airport without passing through the ‘Talha’ or deportation centre. We would like to thank the Ministry of Interior especially Col Waleed, the Chief of Farwaniya Security Directorate for making this possible, “stated Dado.